Ed experiments with knotted, wrapping and various macrame knots - mainly double half hitch. 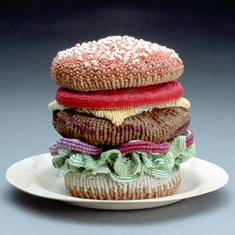 The 'Picnic' series marked Ed's first foray into the world of fibre art. 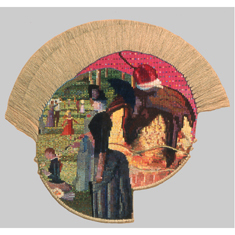 The series dating from the mid 1980s, juxtaposed selected passages from two of George Seurat's monumental paintings, namely Sunday on the Grande Jatte and Bathers at Asnieres, with contemporary food images selected from advertising art. 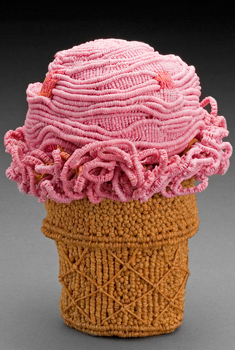 Some 10 years later, he turned again to the food images, visualising them three dimensionally. However, the transition from earlier pieces to sculptural forms was not an immediate one; he moved gradually through several series, including framed pieces of historical miniatures, bas-relief of Orchids, the Earthcrust series and the current series, titled Meditations on the Chawan. 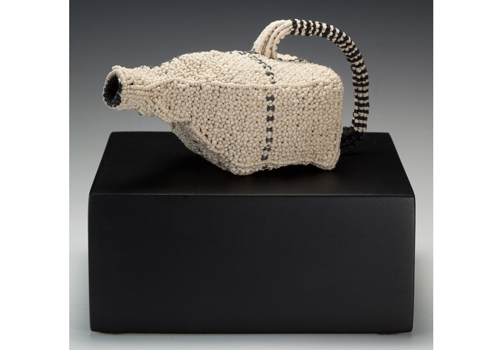 "My initial attraction to the process of knotting was its immediacy and the fact that little specialised equipment is required, which allows for great latitude in approach as to design, concept and technique. 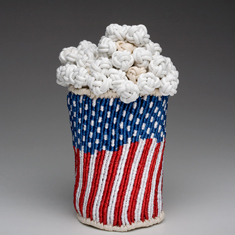 In the Picnic series the work is akin to making a tapestry. The image is created by vertical clove hitch over a fixed 'warp,' guided by a cartoon. I thought the process of creating an image of multicolour knots is not unlike Seurat's pointillism. 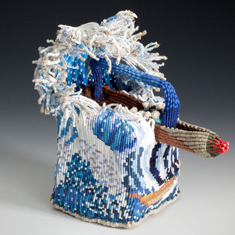 In three dimensional or sculptural work, the knotting process is most forgiving and the work can progress in many directions simultaneously," he says. Ed continually returns to art history for visual and conceptual stimulation: "For me it is the perfect jumping off point for work in a technique that knows no boundaries".